Also known as Awake, Glad Heart! Get Up and Sing! Source: Henry Vaughan (1622-1695), Silex Scintillans: or Sacred Poems and Private Ejaculations (1650), pp. 61-63. Shining, or singing still to thee. The Lord of life be borne in Earth. And shall we then no voices lift ? Of no more acceptation ? Of all his woes remain ? Can neither Love, nor suff'rings bind ? Are we all stone, and Earth ? Nor one day blesse his birth ? 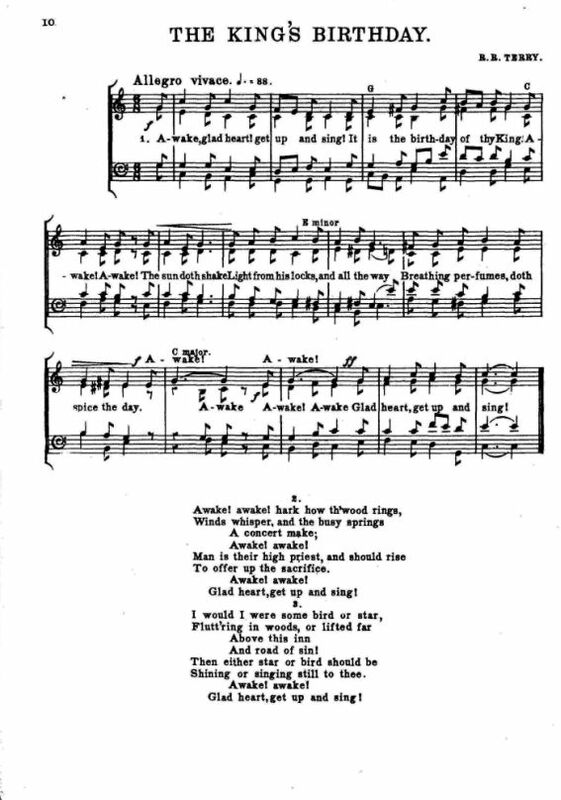 Sheet Music from Richard R. Terry, Twelve Christmas Carols (London: J. Curwen & Sons, Ltd., 1912), p. 10. This poem was published in Part I of Silex Scintillans: or Sacred Poems and Private Ejaculations (1650). Part I of Silex Scintillans was published in 1650; Part II was published in 1655, together with Part I.
Vaughan was known as “The Silurist.” The name "Silurist" refers to the Silures, a Celtic tribe of pre-Roman south Wales that strongly resisted the Romans, according to the Wikipedia article, Henry Vaughan (Wikipedia contributors. "Henry Vaughan." Wikipedia, The Free Encyclopedia. Wikipedia, The Free Encyclopedia, 24 Mar. 2018. Web. 15 Apr. 2018.). THAT this kingdom hath abounded with those ingenious persons, which in the late notion are termed Wits, is too well known. Many of them having cast away all their fair portion of time in no better employments than a deliberate search, or excogitation of idle words, and a most vain, insatiable desire to be reputed poets ; leaving behind them no other monuments of those excellent abilities conferred upon them, but such as they may—with a predecessor of theirs—term parricides, and a soul-killing issue, for that is the and laureate crown, which idle poems will certainly bring to their unrelenting authors. Cænosum versare solum, &c. . . . . . . . .
A dirty sink, &c. . . . . . . . . This comparison is nothing odious, and it is as true as it is apposite ; for a good wit in a bad subject, is—as Solomon said of the fair and foolish woman—“Like a jewel of gold in a swine's snout,” Prov. xi. 22. Nay, the more acute the author is there is so much the more danger and death in the work. Where the sun is busy upon a dunghill, the issue is always some unclean vermin. Divers persons of eminent piety and learning—I meddle not with the seditious and schismatical—have, long before my time, taken notice of this malady ; for the complaint against vicious verse, even by peaceful and obedient spirits, is of some antiquity in this kingdom. And yet, as if the evil consequence attending this inveterate error were but a small thing, there is sprung very lately another prosperous device to assist it in the subversion of souls. Those that want the genius of verse, fall to translating ; and the people are—every term— plentifully furnished with various foreign vanities ; so that the most lascivious compositions of France and Italy are here naturalized and made English : and this, as it is sadly observed, with so much favour and success, that nothing takes—as they rightly phrase it—like a romance. And very frequently, if that character be not an ivybush, the buyer receives this lewd ware from persons of honour, who want not reason to forbear ; much private misfortune having sprung from no other seed at first than some infectious and dissolving legend. To continue—after years of discretion— in this vanity, is an inexcusable desertion of pious sobriety : and to persist so to the end, is a wilful despising of God's sacred exhortations, by a constant, sensual volutation or wallowing in impure thoughts and scurrilous conceits, which both defile their authors, and as many more as they are communicated to. If “every idle word shall be accounted for,” and if “no corrupt communication should proceed out of our mouths,“ how desperate, I beseech you, is their condition, who all their life time, and out of mere design, study lascivious fictions : then carefully record and publish them, that instead of grace and life, they may minister sin and death unto their readers ? It was wisely considered, and piously said by one, that he “would read no idle books ; both in regard of love to his own soul, and pity unto his that made them ;” “for,” said he, “if I be corrupted by them, their composer is immediately a cause of my ill : and at the day of reckoning —though now dead—must give an account for it, because I am corrupted by his bad example, which he left behind him : I will write none, lest I hurt them that come after me ; I will read none, lest I augment his punishment that is gone before me. I will neither write, nor read, lest I prove a foe to my own soul : while I live, I sin too much ; let me not continue longer in wickedness than I do in life.” It is a sentence of sacred authority, that “he that is dead is freed from sin ;” because he cannot in that state, which is without the body, sin any more ; but he that writes idle books, makes for himself another body, in which he always lives, and sins—after death—as fast and as foul as ever he did in his life ; which very consideration deserves to be a sufficient antidote against this evil disease. And here, because I would prevent a just censure by my free confession, I must remember, that I myself have for many years together, languished of this very sickness ; and it is no long time since I have recovered. But, blessed be God for it, I have by His saving assistance suppressed my greatest follies, and those which escaped from me, are, I think, as innoxious, as most of that vein use to be ; besides, they are interlined with many virtuous, and some pious mixtures. What I speak of them is truth : but let no man mistake it for an extenuation of faults, as if I intended an apology for them, or my self, who am conscious of so much guilt in both, as can never be expiated without special sorrows, and that cleansing and precious effusion of my Almighty Redeemer : and if the world will be so charitable as to grant my request, I do here most humbly and earnestly beg that none would read them. But an idle or sensual subject is not all the poison in these pamphlets. Certain authors have been so irreverently bold as to dash Scriptures and the sacred Relatives of God with their impious conceits ; and—which I cannot speak without grief of heart—some of those desperate adventurers may, I think, be reckoned amongst the principal or most learned writers of English verse. The suppression of this pleasing and prevailing evil lies not altogether in the power of the magistrate ; for it will fly abroad in manuscripts, when it fails of entertainment at the press. The true remedy lies wholly in their bosoms, who are the gifted persons, by a wise exchange of vain and vicious subjects, for divine themes and celestial praise. The performance is easy, and were it the most difficult in the world, the reward is so glorious that it infinitely transcends it : for “they that turn many to righteousness shall shine like the stars for ever and ever :” whence follows this undeniable inference, that the corrupting of many, being a contrary work, the recompense must be so too ; and then I know nothing reserved for them, but “the blackness of darkness for ever ;” from which, O God, deliver all penitent and reformed spirits ! The first, that with any effectual success attempted a diversion of this foul and overflowing stream, was the blessed man, Mr. George Herbert, whose holy life and verse gained many pious converts, of whom I am the least, and gave the first check to a most flourishing and admired wit of his time. After him followed diverse, Sed non passibus æquis ; they had more of fashion than force. And the reason of their so vast distance from him, besides differing spirits and qualifications—for his measure was eminent—I suspect to be, because they aimed more at verse, than perfection, as may be easily gathered by their frequent impressions and numerous pages. Hence sprang those wide, those weak, and lean conceptions, which in the most inclinable reader will scarce give any nourishment or help to devotion ; for not flowing from a true, practick piety, it was impossible they should effect those things abroad, which they never had acquaintance with at home ; being only the productions of a common spirit, and the obvious ebullitions of that light humour, which takes the pen in hand, out of no other consideration, than to be seen in print. It is true, indeed, that to give up our thoughts to pious themes and contemplations—if it be done for piety's sake—is a great step towards perfection ; because it will refine, and dispose to devotion and sanctity. And further, it will procure for us, so easily communicable is that loving spirit, some small prelibation of those heavenly refreshments, which descend but seldom, and then very sparingly, upon men of an ordinary or indifferent holiness ; but he that desires to excel in this kind of hagiography, or holy writing, must strive by all means for perfection and true holiness, that “a door may be opened to him in heaven,” Rev. iv. I, and then he will be able to write—with Hierotheus and holy Herbert—a true hymn. To effect this in some measure, I have begged leave to communicate this my poor talent to the Church, under the protection and conduct of her glorious Head, Who, if He will vouchsafe to own it and go along with it, can make it as useful now in the public, as it hath been to me in private. In the perusal of it, you will peradventure observe some passages, whose history or reason may seem something remote ; but were they brought nearer, and plainly exposed to your view—though that perhaps might quiet your curiosity—yet would it not conduce much to your greater advantage. And therefore I must desire you to accept of them in that latitude, which is already allowed them. By the last poems in the book, were not that mistake here prevented, you would judge all to be fatherless, and the edition posthume ; for, indeed, “I was nigh unto death,” and am still at no great distance from it : which was the necessary reason for that solemn and accomplished dress you will now find this impression in. But “the God of the spirits of all flesh” hath granted me a further use of mine than I did look for in the body ; and when I expected, and had by his assistance prepared for a “message of death,” then did He answer me with life ; I hope to His glory and my great advantage, that I may flourish not with leaf only, but with some fruit also ; which hope and earnest desire of His poor creature, I humbly beseech Him to perfect and fulfil for His dear Son's sake, unto Whom, with Him and the most holy and loving Spirit, be ascribed by angels, by men, and by all His works, all glory, and wisdom, and dominion, in this the temporal and in the eternal being. Amen.